Since 1960, Utah electricity consumption (sales) has increased at an average rate of 4.3 percent each year. While the year-over-year rate of increase can fluctuate with broad economic conditions, the overall rate of increase is fairly steady and correlates with the rate of population increase as well as a steady increase in per capita electricity usage—at least up until 2013. After 2013, data show that electricity consumption in Utah decreased slightly and then plateaued. One year of consumption decrease, or one or two years of only minor increases, are normal and usually correspond to economic recessions (like in 2008). However, with full-year data for 2017 now available, electricity sales in Utah are in their fourth year of stagnant growth and this is occurring at a time when the Utah economy is performing at an all-time high. So, what might be happening? What has changed? 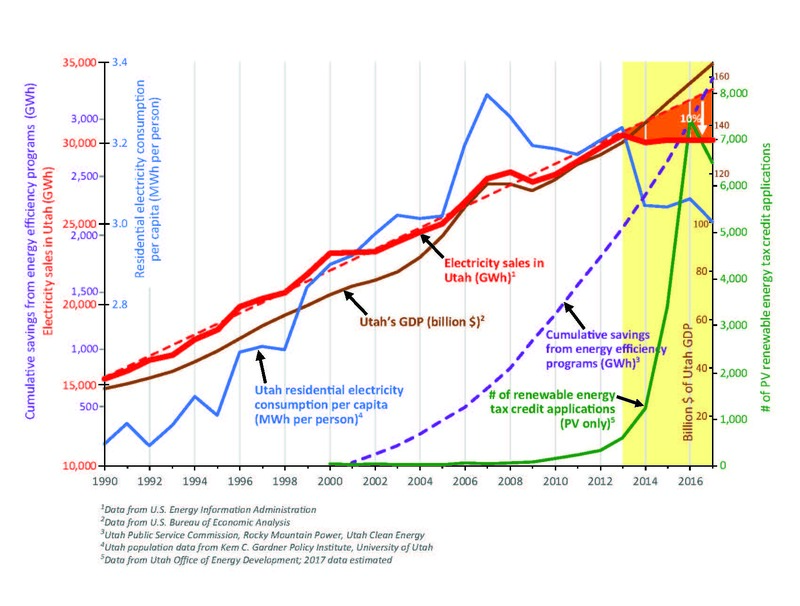 The graph to the left displays total electricity sales for the state of Utah (bold red line) from 1990 to 2017. This line shows a steady growth rate of 3 percent per year, illustrated by the red dashed trend line, at least until 2013. After 2013, electricity sales decreased slightly then remained steady until 2017 when consumption totaled 30,202 gigawatthours (GWh). If sales growth had continued at the same steady rate seen from 1990 to 2013, electricity demand in 2017 should have increased to 33,320 GWh. It appears that something has reduced utility-scale electricity sales in 2017 by over 3,000 GWh, or roughly 10 percent. One possible culprit is the recent explosion in distributed (residential and commercial) rooftop photovoltaic (PV) solar systems; all one needs to do is drive around Salt Lake City (or any other city) to see all the new glistening PV panels adorning numerous rooftops. Tracking total electric generation from these new solar arrays is difficult because power companies only track net electricity sent back to the grid, not necessarily all electricity generated and used onsite—and often this data is not available in the public domain. However, as more and more PV systems come online throughout the state, there inevitably will be an effect on utility-scale electricity demand. The exponential growth of Utah’s residential and commercial PV capacity is most easily recognized by plotting the number of renewable energy tax credits processed each year. In 2009, Utah processed only 86 renewable tax credits for PV systems in the state. By 2016, that number jumped to over 7,000, a true “hockey stick” of spectacular growth (green line on graph). In contrast to utility-scale solar systems (which also have increased dramatically in the state to over 800 megawatts in capacity), the net generation from rooftop systems does not get recorded in publicly available statewide statistics. On the other hand, the effect of Utah’s vast new rooftop solar capacity does seem to be showing up as a reduction in electricity consumption, since residential and commercial customers are consuming less utility-generated electricity. But does this account for the entire 3,000 GWh reduction in sales? Let’s do the math: non-utility-scale solar capacity averaged 162 megawatts in 2017 (data from the U.S. Energy Information Administration). If we apply an estimated 20 percent capacity factor (CF, annual average for Utah), we can expect that these PV panels generated about 284 GWh of electricity in 2017 (162 MW x 24 hours x 365 days x 0.2 CF). So, the current distributed solar in Utah can only account for about 10 percent of the estimated reduction in consumption (or 284 GWh of the 3000 GWh of decreased sales). So, what about the remaining 90 percent? Let’s look at another electricity consumption metric that also shows a decrease after 2013—residential electricity sales per person in Utah, the blue line on the graph. Consumption per capita steadily increased from 1990 to 2007 (at a rate of 1.2 percent per year), where it peaked at 3.32 megawatthours (MWh) per person per year. Usage decreased between 2007 and 2011 due to the economic recession, before increasing again in 2012 and 2013 to 3.24 MWh per person. Instead of continuing an upward trend, which should have resulted in a usage of about 3.6 MWh per person in 2017, per person sales decreased to 3.01 MWh, a 16 percent reduction. But the question remains, what is driving this post-2013 decrease in sales? Have you recently changed your lightbulbs from incandescent to compact fluorescents? What about to LEDs? Have you installed a new air conditioning unit lately? What about adding insulation in your attic? These seemingly small home improvements can all add up to make a dramatic impact on Utah’s overall electricity demand. The true effects of the often-overlooked energy efficiency practices on Utah’s overall demand are difficult to quantify, but the evidence is quite clear—Utah has experienced a dramatic decrease in demand that cannot be totally explained by an increase in distributed solar. Since 2001, PacifiCorp’s Rocky Mountain Power, which serves 80 percent of Utah’s consumers, has saved an estimated 3,356 GWh (cumulative total from 2001 to 2017) of electricity through its various energy efficiency programs (purple line on graph). This is slightly higher than the estimated 2.700 GWh mentioned above but is in the right ballpark. Energy efficiency effects can also be qualitatively examined by studying the relationship between electricity use and Utah’s gross domestic product (GDP). As stated previously, total demand for electricity has flattened since 2013, but Utah’s GDP still shows significant annual growth (brown line on graph). This comparison suggests that the strong energy efficiency programs being pushed by Rocky Mountain Power, other smaller utilities, and by local and state governments are having a dramatic effect on Utah’s electricity demand. The data clearly show a major change in electricity usage in Utah starting in= 2013. Undoubtably a small portion of this change is the direct result of exponential growth in residential and commecial solar systems. But, solar only accounts for roughly 10 percent of the change; the other 90 percent is harder to nail down but is most likely the result of an increase in energy efficiency programs implemented by Rocky Mountain Power and other groups over the past 5 to 10 years. At some point, growth in the electricity sector will return. The “low hanging fruit” of energy efficiency will soon be exhausted (at least until new technology arrives and the cycle repeats), and incentives for rooftop solar are being reduced—already resulting in a slow down of the total number of tax credits processed, down to about 6,500 in 2017 compared to the 7,400 in 2016. In addition, there is the looming electrification of our transportation system that could create major changes to our electricity demand. But in the meantime, Utah should be proud of the progress it has made in becoming more efficient and more green. Glad You Asked: Why are Natural Resources, such as Coal, Found in Some Places but not in Others?